Abandoned warehouses turned into cool chic venues must be one of my favorite looks. The recycling of an old building for a new purpose (given of course that it's still structurally and environmentally sound) makes so much more of a statement (not to mention sense) then tearing it down and erecting another, usually pre-fab, structure. 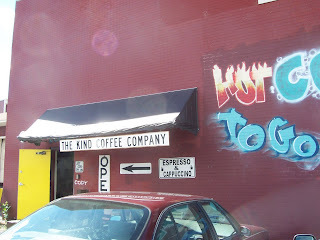 So looking at Syracuse, NY with its abundant supply of abandoned warehouses, I grew excited when I stumbled across Kind Coffee Company near downtown Armory Square in what looked like an old industrial building. The spray paint making up the majority of the signage and the rich red exterior impressed upon me that it was indeed the makings of an intriguing establishment. To say my initial intrigue was satisfied when I walked in would be putting it lightly. As I entered through the front door, I am greeted by the perplexing sight of a barely rejuvenated warehouse with barely any artificial light (not to mention natural sun) and some truly mysterious furniture. Don't get me wrong; I love the bohemian look to coffeehouses, but Kind took it to the level that I was not comfortable sticking around. 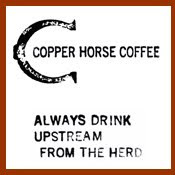 The coffee is roasted in-house fresh every weekday, with the coffee darkness escalating as the week goes on (i.e. you want to come in Monday or Tuesday if you want a light roast and Friday if you want it dark). He roasts in an industry culinary oven of sorts (which you can do at home in your basic kitchen oven) that seems to give roasts with varying shades (not a bad thing, just a factor from experience that makes roasting a little harder to predict). The coffee in-house wasn't bad, both cups full-bodied but both were coffees that were roasted day-of, as Kind does not keep coffee past the day its roasted (and coffee doesn't reach maturation until about three days after roasting). I also took a pound to go and to my distinct pleasure, it proved to possess decent quality. The espresso on the other hand was shady, coming from a machine that looks like it's seen a couple wars. As far as skill, the shots were definitely over-pulled. Didn't catch if they had any tea. Needless to say, Kind is quite a unique establishment and could hold some promise for future improvement. For now, I would only recommend Kind if you're in the market for a pound of coffee or quick cup of drip coffee to go. The coffee is not roasted in an "industry culinary oven of sorts". It is is roasted in a fluid bed air roaster. 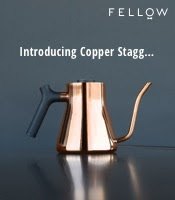 It does not just "seem to give roasts of varying shades" rather it roasts to any of 100 reproducible and consistent roasts with very little variance between beans as measured by an Agtron. The difference between this device and the others is the highly controlled individual bean. While roasting, the hot air temperature is controlled in most all the modern roasters, but the air is injected into the coffee bean group. The coffee beans don't always migrate around evenly. In this roaster, the coffee beans fall down and enter a tube, the hot air forces the bean up through the tube and to the top of the bean pile. Effectively, the coffee beans are roasted one at a time. I do not throw away any beans, In house coffee is brewed from beans up to a week old but beans sold as "fresh" are up to a day old. I prefer the beans to age on the customers' time-not my own. The available roasts generally DO escalate in degree as the week progresses but I also roast to order with a one pound minimum and 100 degrees of roast choice. The espresso machine has not seen any wars and is a Laurentis. I pull 25 to 30 second shots and will ALWAYS try again if you are not happy with the espresso you have been served. Nothing mysterious about the furniture...3 couches and a coffee table. Thanks for the generally accurate review. Interesting blog as for me. I'd like to read something more about that topic. Thanks for giving that information. It is very interesting for me to read this post. Thanx for it. I like such topics and anything connected to them. I would like to read more soon. Pretty nice blog you've got here. Thanx for it. I like such topics and anything connected to them. I definitely want to read more on that blog soon. It was rather interesting for me to read that post. Thanks the author for it. I like such themes and anything that is connected to them. I would like to read more on that blog soon. Actually, I consider the cuppa one of the best in the country. I travel a lot and judge a coffee shop by one thing only, the cuppa.